IRiver's iMP-150 ChromeX player with remote control supports multiple standards of digital audio format, music CD, homemade CDR/RW with MP3, WMA and even ASF format. 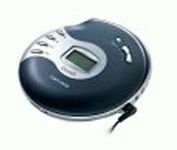 This affordable CD player features Shock-Free to give you more enjoyment and freedom as well as Graphic LCD supporting multiple languages. The player provides the latest updated features via firmware upgrade. New formats such as AAC, MP3 Pro and so on can be supported in the future with a simple upgrade method. The player's features such as add on, modification, and continuous improvement of disk recognition are always provided. In addition, the iMP-150 can support Winamp Playlist as long as it has the filename extension.m3u (maximum 20 lists).